The Northern Virginia Walk is held annually at the Reston Town Center. The TeraThink folks who braved the weather showed up a little before 1:30 pm so we could walk as a team. Sponsors lined the streets with tables full of insightful information; there was even a fun table for face painting (a hit for all the kids!). Prior to the Promise Garden ceremony, participants chose flowers of different colors to represent their connection to the disease. 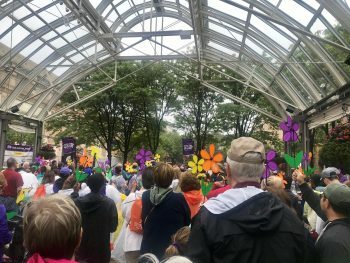 This experience allows walkers to raise flowers representing their promise to remember, honor, care, and fight for those living with Alzheimer’s disease. It was a powerful moment to see people raise their flowers in the air before the start of the walk. TeraThink set a goal of $2500 this year for the walk. I am proud to say TeraThink exceeded that goal! I work with a wonderful group of individuals who continuously give their time and money to many charities, including this walk. 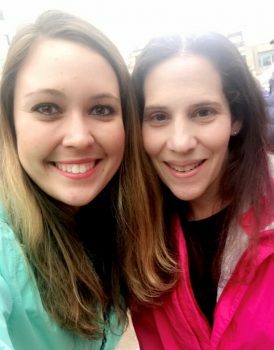 The 2018 Northern Virginia chapter for the Walk to End Alzheimer’s raised over $276,000! TeraThink looks forward to joining the walk again next year and raising even more money for such an important cause. If you would like to join us next year, or donate to this worthy cause, let us know!